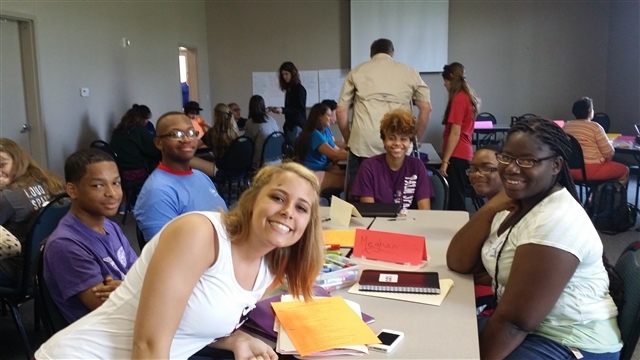 Conference Council on Youth Ministries (CCYM)--youth selected by their peers to represent each of the six districts in the Louisiana Conference--gathered at LYMO in July to see how they can reach youth and make an impact in The United Methodist Church through youth events. Participants also learned how to lead small groups, plan and execute events and engage in strategic planning. CCYM youth, along with District Coordinators and District Associates, are responsible for planning and implementing Youth Ignite, Youth Leadership Training, Junior High Retreat and Senior High Retreat. CCYM youth-led events provide opportunities for youth throughout the Louisiana Conference to fellowship, worship and learn and grow together in Christ. The theme for youth events in 2014-15 will focus on the theme "IHOPE" based on Romans 12:12- "Be joyful in hope, patient in affliction and faithful in prayer." "This message will give young people the encouragement they need to have a closer relationship with Christ, strengthen in their faith and be steadfast in difficult times," said Sabrina Short, Conference Youth Strategist. All churches are invited to attend and participate in CCYM events. CCYM is the youth leadership development program of the Office of Youth Ministries, led by and for youth. If you are interested in sponsoring, serving or learning more about your district youth program, contact your district coordinator for more information.